In Industry it is not efficient or profitable to make everyday products by hand. On a CNC machine it is possible to make hundreds or even thousands of the same item in a day. 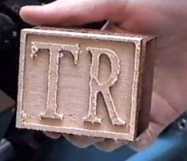 First a design is drawn using design software, then it is processed by the computer and manufactured using the CNC machine. The machine featured below is the BOXFORD DUET. This is a small CNC machine and can be used to machine woods, plastics and aluminium. In industry, CNC machines can be extremely large. The Duet is one of the smaller CNCs and is ideal for use in schools. Have a look at the photograph on the right. Can you imagine how long it would take a skilled worker to ‘carve’ this shape out of wood or a soft material - it would probably take a full day. We will be going through its manufacture, one step at a time using a CNC machine (next page). How long do you think manufacturing this product with a CNC machine will take ? The VICE: This holds the material to be cut or shaped. Material must be held securely otherwise it may 'fly' out of the vice when the CNC begins to machine. Normally the vice will be like a clamp that holds the material in the correct position. The GUARD: The guard protects the person using the CNC. When the CNC is machining the material small pieces can be 'shoot' off the material at high speed. This could be dangerous if a piece hit the person operating the machine. The guard completely encloses the the dangerous areas of the CNC. The CHUCK: This holds the material that is to be shaped. The material must be placed in it very carefully so that when the CNC is working the material is not thrown out at high speed. The MOTOR: The motor is enclosed inside the machine. This is the part that rotates the chuck at high speed. The LATHE BED: The base of the machine. Usually a CNC is bolted down so that it cannot move through the vibration of the machine when it is working. The CUTTING TOOL: This is usually made from high quality steel and it is the part that actually cuts the material to be shaped. 1. Draw a small CNC machine and label the most important parts. 2. List the safety factors that people must be aware of before they operate a CNC or similar machine.